If you’ve been to the Peanut Butter & Co. Sandwich Shop in NYC you may have seen the Peanut Butter BLT on the menu. The only difference between that and a normal BLT is using peanut butter instead of mayonnaise. I hate mayonnaise but love BLT’s and the peanut butter version is quite tasty. But I’m sharing something different with you today. Instead of Peanut Butter BLT’s, how about some Peanut Butter T’s? No, not T-shirts (although I have a great shirt idea but am in need of an artist), but Peanut Butter Tomato sandwiches. Not really a sandwich, more like on toast…and for breakfast. As strange as it sounds, I didn’t come up with this. I received an email from a reader named Dan who told me that his mom used to make him this for breakfast when he was young. I wanted to know more so I asked him to dig up some info. Dan’s mother, now 83, used to have it for breakfast growing up in West Virginia when her mother (Dan’s grandmother) would make it for her. Dan’s mother was born in 1925, about 30 years after peanut butter was first invented, but smooth peanut butter wasn’t commercially available until about 1928 when Peter Pan was founded. She missed the Universal Exposition of 1904 (and unfortunately so did I) where plain peanut butter sandwiches were all the rave, but she was born at a very exciting time for Americans (can you imagine a world without peanut butter?). Our old friend, the PB&J, wasn’t invented until after 1940, so she enjoyed what can only be one of the first peanut butter creations: Peanut Butter and Tomato on Toast. How can you not try this historical peanut butter creation? 1. Toast the bread, spread on peanut butter and top with tomato. Sprinkle on salt and plenty of pepper. Eat with a knife and fork. 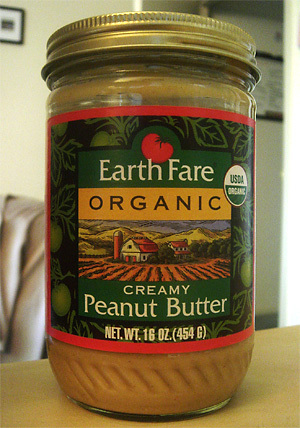 Also, here’s a quick review for Earth Fare peanut butter that I originally used for this creation! I was impressed at how good this was. I had it for a midday snack but could definitely see eating it for breakfast. Apparently, Dan has it for breakfast to this day and he suggests adding some bacon underneath the tomato for an extra treat! I think we need a peanut butter exchange of some sort, where people from different regions can submit their favourite peanut butters, and receive something from somewhere else in exchange. I would definitely pony up a jar of my favourite Bulk Barn organic with sea salt in exchange for something from the US. So, what’s the verdict on the peanut butter and tomato. I love tomatoes and peanut butter, but together? I clicked on the link with great anticipation, and was slapped in the face with a tomato. Whoa… didn’t see that coming. I don’t really like tomatoes (at least in this form — ask me the question again when there’s a lasagna in front of me). And I initially thought this a strange combination. But then I remembered a dish served at a restaurant here: Spicy African Peanut Soup. Which is basically peanut butter melted into tomato soup, with lots of hot sauce mixed in. I am all over that creation. Looks very good. I might just add a bit of cracked black pepper on top of the tomato. Very nice. I may try this tomorrow morning. Looks very pretty with the brown and red. But I personally am not a big fan of tomatoes. With that said, I sure can eat the rest of the toast! Hmmm, you never know it could become a craze like “hey, you got your chocolate in my peanut butter….” (that’s an OLD commercial for Reese’s pb cups). Now THAT’S an intriguing combination – yum! Anne, I agree! That would be an awesome idea. I could even throw in my homemade cinnamon raisin variety, get some feedback and see if it’s a store-worthy item =)! ttfn300, Not sure I’d want to live there but you never know until you try! Sagan, And that’s the entire basis for my blog, I’ll never run out of ideas! Hangrypants, Verdict is: try it, you’ll be pleasantly surprised. I’ve used peanut butter mixed with ketchup and a few other things for a meat marinade. Charlie, Haha, good to find another peanut butter boy. I think I should totally make peanut butter boy/girl t-shirts, I think people would want em! I’m going to try a African peanut soup real soon, there’s a couple of great recipes out there. ZestyCook, Let me know if you do, I’d love to hear feedback. Divya, What’s the site for those places? I found some weird roundabout links when I searched for them. Katrina, Haha yea, Kath commented right above you, but she was probably too angry to mention tomatoes =). I love that old commercial for Reese’s! Good point! I often make peanut butter sauces for noodle dishes that have other veggies, so I guess it’s not all the odd. http://connect.sailusfood.com/ – Goto suggest a feed on your right. http://www.recipemuncher.com/ – Goto Add your blog on the top. http://foodworld.redchillies.us/- Email the ID on your right. You know, that sandwich saounds amazing. I eat tomato sandwiches and peanut butter sandwiches (on gluten free bread of course) so why not combine the two. ANd I am with zesty cook – fresh ground pepper and some course salt. YUM! I just stumbled upon your blog…very cool. I had no idea that there was man as obsessed with peanut butter as much as my boyfriend. That being said…the Safeway in Auburn, CA has a nut bar with 3 different “butter” machines; peanut, almond and I can’t remember the other. Diva, Give it a try, let me know what you think! Divya, Thanks! I submitted it to all 3, let’s see if I get added or not. Carol, By tomato sandwiches you mean just tomato? or sandwiches with tomato and sandwiches with peanut butter? Either way, this on toast thing worked better than I thought. Can’t go wrong with tradition! Michelle Ann, Thanks! Tell your boyfriend I say hello =). Oooh, I love those machines. We have a few Safeways around here but they don’t have those machines! Perhaps the third is honey roasted peanut butter? If so, get some ASAP! That is one of the best peanut butter you’ll find. Sorry, but as a PROFESSIONAL CHEF, and the SENIOR ADVISER at the SeriousEats website, I think that your PB & tomato on toast is disgusting. Well, SeriousEats is one website I can cross off my list. I found out a while ago that “therealchiffonade” is someone mocking the real senior adviser from Serious Eats. Apparently the real adviser was someone with “chiffonade” in her username but this person above got annoyed and started posting nasty comments all around the internet trying to ruin the real person’s reputation. People have tried talking to “therealchiffonade” but she is literally deranged. You know, I wondered, after I replied to that, if it was someone pretending to speak for that blog. It was too tacky. I’m glad you told me, and I’ll put Serious Eats back on my list. Yea, it was too off-base which is why I investigated it. Although since then I think the Serious Eats editor has changed her username to no longer include chiffonade. Wouldnt hv paired peanutbutter with tomato but hey, never know till one tries. The range of PB over at your side of the world is amazing. Nick, this is a really interesting history. Thanks for sharing! I need to go try that shop–they have adverts all over campus promising me my own free jar of PB with any purchase. How can I resist? The PBLT it will be. The road to fame is so full of controversy isn’t it? I don’t think peanut butter and tomatoes together would do it for me but hey, what do I know. I’m only the grasshoppah here. Gosh, I love peanut butter… with almost anything! I’m going off now to check out your no-bake post. Yummmmy! Oh, and may I add you to my bloroll? Hmmm, is new and interesting to me. I think I’ll try it. Daphne, I never would have thought of it either. You should just order like 10 cases of peanut butter from over here so you’ll always have a jar handy! Chou, Free jar? Why aren’t I going to that school??!? Giz, Hey you never know, you may love it! Sometimes it’s the first things that come to mind that are the best, and this came before jelly apparently. now that is a cool concept! We are both artists, would be happy to draw something for ya–what are you looking for? Mmmmm… pb&co. I love their Elvis sandwich. Do you ever eat PB and red onion sandwiches? I am so glad I found this site. Peanut butter is my favorite food! I think this recipe captures the sweet/salty dual nature of peanut butter. I can’t wait to try it! tried this lately and it is GREAT, the black pepper and salt really makes it! peanut butter and celery sandwich is also quite satisfying. I’m 73, and I’ve been making this for myself & my five children (now for my grandchildren who love it too) since I was a child in Texas in the early 40s. We raised our own wonderful tomatoes, and because meat was rationed we ate a LOT of PB. It is still my–and most of my kids’/grandkids’–favorite quick breakfast or snack IF you have good tomatoes. (Thank goodness for the “Ugli Ripe” & “Vintage Variety” old species tomatoes my grocery now sells year ’round.) Try it with a slice of sharp cheddar, too. Put a slice of toast spread w/PB, the other w/the slice of cheese, under the broiler till they bubble. Lay on a slice or two (I like thin slices) of good tomato, sprinkle w/Kosher salt and cracked pepper, slap together. Very interesting. This seems like such a rare recipe but one that is loved by the people who know it. I need to try it with some better tomatoes. I like the sandwich idea, I’ll give it a try real soon. Got any other PB-centric recipes? If so, click here to submit them, I’d love to try them out and/or post them! Why it is rare I’ll never understand. Of all the countless things you can combine w/PB, (assuming, of course, that one loves both PB & tomatoes) this is the most mutually complimentary. AND the healthiest! I love what that ellacinderseats blog post points out: “Stunningly simple and healthy (carb plus protein plus fruit equals complete breakfast), this has become my go to breakfast…”. Yes, my mom (in her 60s) has made this sandwich for her entire life, probably handed down. She always added onion – and maybe cheese. I was looking it up to try and figure out the proper additions and variations, and was surprised not to find many mentions of this kind of sandwich! I have to try these other combinations. Next time I find a large ripe tomato at the store I shall try all these combos! But is the cheese cold or did she toast the sandwich? And raw onions? Hey Nick – Definitely raw onion, and if she added cheese (I can’t remember for sure if she did), it wouldn’t have been melted. I remember her assembling everything right out of the fridge. At most the bread may have been toasted. I’ll try to find out more, and report back! Awesome site, by the way! So many great ideas. Sounds good, let me know! And thanks! P.S. Just noticed Caviar & Codfish’s comment re: PB & red onion. If you want the ultimate sandwich, add sliced red onion to my PB/tomato/sharp Cheddar combo. Almost too good. I am 41 years old, from Wisconsin, and my dad ate peanut butter and tomato slices on toast all time when I was a kid. The first time I saw him eat that I thought it was the most disgusting thing I had ever seen. However, one day when I was about 16 years he convinced me to try one and I was hooked ever since. Alot of salt and pepper on the tomato for me! To this day I still crave them and when I was pregnant with my first child, I couldn’t stop eating them. As much as I eat them these days, I can’t convince my husband or children to try them. Maybe they too will finally give in and try one, but until then, the tomatoes and peanut butter on toast are all mine – yeah! 1. Are either of your children under 16? If so, for their 16th birthday, have a box and wrapping paper cut and ready. Then, when they wake up, make this recipe, put it in the box and wrap it up! 2. Does your family eat turkey burgers? If so, try making them a turkey burger with lettuce and tomato and sneak some peanut butter onto one of the buns. That will get them to try the peanut butter and tomato combo! If they complain, just say it was a mix-up and was meant to be yours =). I am so thrilled to have found other people who love PB and tomato on toast as much as I do. Before this site I have never found another person who has tried it let alone even heard of it. When I explain this combination to people they just look at me like I just told them there’s an alien standing behind them. I have been eating toast with peanut butter and sliced tomatoes & dash of salt for over 20 years. This is truly my favorite thing to eat for breakfast. Before that I had peanut butter, tomato & mayonnaise sandwiches (kinda fattening) as a kid. When you mention this as a great thing to eat, most people cannot get their heads around this combination, although I do have a friend who eats peanut butter with sliced dill pickles sandwiches. 20 years? Man, I keep hearing stories like this…It definitely seems like a simple recipe that got lost in time, noone has heard of this dish nowadays. As for the pickle sandwiches, I’ve heard the same. I had yet to try it though, and now I resolve to do so! 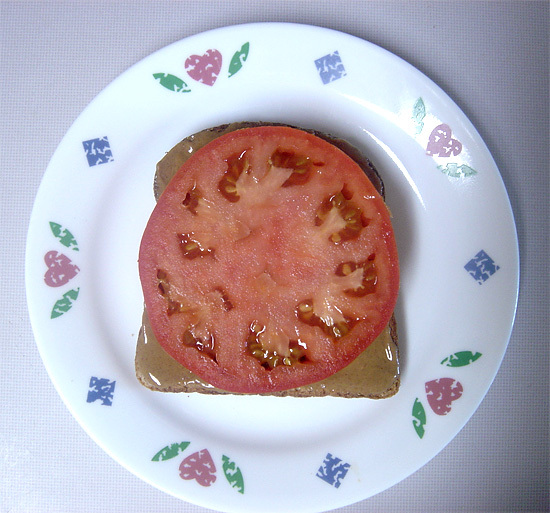 I have eaten tomato on peanut butter toast with salt since I was a kid. My dad also ate onion slices on white bread with peanut butter, and it is delicious. I wouldn’t put pepper on my peanut butter, but to each his own. onions and peanut butter on white bread – raw onions? untoasted bread? interesting stuff. The pepper was a nice addition, but I’ll have to try it without for comparison. Not going to lie: the idea of tomatoes and peanut butter didn’t sound all that appealing. Then you added pepper and I was even more skeptical. I admit though, I had this as a post workout snack and I LOVED it. I can’t wait to have it again!! Thanks for the great idea. I’m with you – it doesn’t sound good at all, but I’m glad you enjoyed it! It still amazes me that some of the weirdest sounding peanut butter recipes on my site have the best feedback. I better go buy some local market tomatoes before the season is gone! I made one of those. Only mine had two slices of toast bread. It was a strange craving I had one day…but it was very good! My mom (also from West Virginia) introduced this combination to me and my brother when we were wee little things. She grew up eating them, and my grandparents grew up eating them. Personally, my favorite way to have them is to eat them as a sandwich, with two slices of bread of whole wheat bread, both slathered with peanut butter, and the tomatoes have to be in season and perfectly ripe. A sub-par tomato loses something in translation. No salt or pepper. Grilled or not, but never toasted. This with a fresh peach and a glass of Canada Dry ginger ale is my favorite summertime lunch. Wow, such an interesting combo and apparently such a popular one! It constantly amazes me how many people grew up eating this. Grilled tomato? or grilled bread? Broiler sounds like a great idea! Thanks for the info! I made a couple of these on toasted English muffin halves last night with a little lemon and garlic powder sprinkled on top. Tasty! 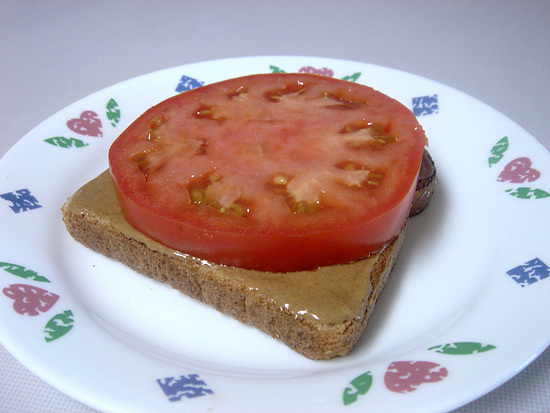 Have loved pb on toast with sliced tomato for 60+years. Have you tried pb on toast with sliced green olives? M-m-mm. Haha thanks Carol. It’s a very rare combination nowadays! This sounds like a strange combination, but after reading the great back story I will be trying this.